220 pages | 20 B/W Illus. Although program management has received much attention in recent books, program governance remains a relatively new subject. While selected books and standards touch on this important topic, few are devoted to program governance as a subject. This book fills that need. Program Governance provides a thorough understanding of governance while reviewing the underlying theories. The first book dedicated to this subject, it caters to the needs of practitioners, researchers, and students of management and governance. 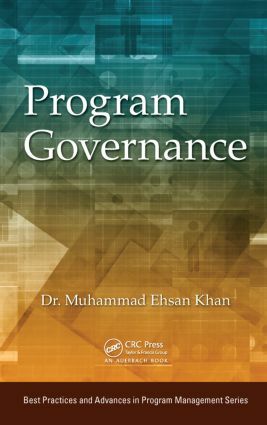 The book provides a holistic view of program governance while covering multiple elements of program governance. Topics covered include the governance structure, governance roles, governance functions, governance mechanisms, factors influencing the governance framework, and different domains of programs that come under the jurisdiction of a governance framework. The book presents the author’s own program governance framework, called the Contingent Governance Framework for Programs (CGFPrgTM), which is adaptable to suit different program contexts. This adaptability ensures that the different elements of governance, including structure and mechanisms, are aligned with program requirements. Such alignment results in an efficient and effective environment with an increased probability of program success. The text supplies references to research and case studies to help readers understand key concepts in more detail. It also includes objectives at the end of each chapter to help readers gauge their knowledge of the subject. The book clarifies the linkage/dependencies between program governance and other governance levels, such as international governance and corporate governance, which have a strong influence on governance framework for programs. It also explains the difference between the dynamics of temporary organizations, such as projects and programs, and permanent organizations. This distinction between temporary and permanent organizations provides readers with a practical understanding of how governance should be implemented in both types of organizations. Why Should Programs Be Governed? Dr. Muhammad Ehsan Khan is an entrepreneur and an internationally acknowledged professional on the subject of Governance and Management of Strategic Initiatives. An award-winning strategist with over a decade of leadership success, and a career that has driven multi-million dollar projects for various clients in Middle East and Pakistan, He is a founding member, and presently serves as a Partner/VP Operations and Service delivery, in a UAE based firm Inseyab Consulting & Information Solutions LLC.
) and Project Management Professional (PMP®). Ehsan is a recipient of PMI James R. Snyder Award for the year 2012 and was awarded the Young Researcher of the year award by IPMA in 2013. He is the author of first every book on the subject of program governance. Dr. Khan has provided management, consulting and mentoring services in the Middle East Region. He has been involved in establishment of PMO, implementation of management and governance frameworks and related practices and tools, in order to create an environment of project management excellence. He has also been managing medium-large scale ICT programs and projects for various customers, especially for ones in the governmental sector.